Some patients suffering from breast cancer and palate cancer were shown to the volunteers. A complete information and training material was provided. 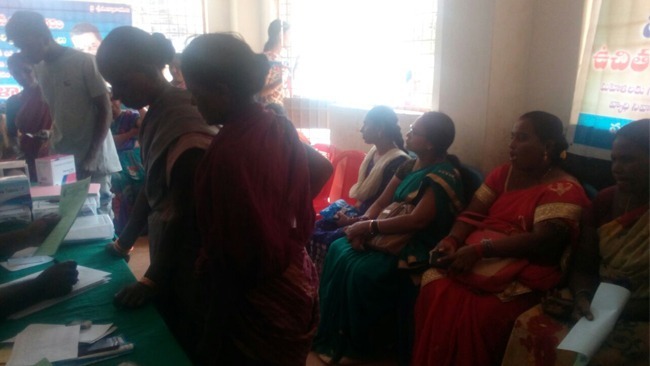 The volunteers were divided in to five batches and named as A, B, C, D and E.
Each batch methodically interacted with the villagers and conducted door to door survey and screening. The surveyed houses were then marked so they could trace easily the left-over houses. There are 375 houses in the Village according to records. Local teachers, health workers and some volunteers from the village accompanied the batches and helped them in tracing the houses. After completing the survey in the village, the screening was continued in the small 5 hamlets which come under Dakamarri Panchayat. (Dasari Peta, Bhugatavari Kallalu, Kallavari Kallalu, Allipeta and Rellipeta). Suspected cases with lumps in their breasts and gynic problems were taken to Dr.Sasiprabha who came forward to examine them on every last Tuesday. Women with the habit of reverse smoking and having patches in the palate were identified and were taken to the hospital. The hospital administration provided a van for transporting the women. Dr. Adityanarayana examined them and gave medicines. Out of them, 4 women ran a high risk of palate cancer. One of them needed a biopsy within 15 days from the detection.